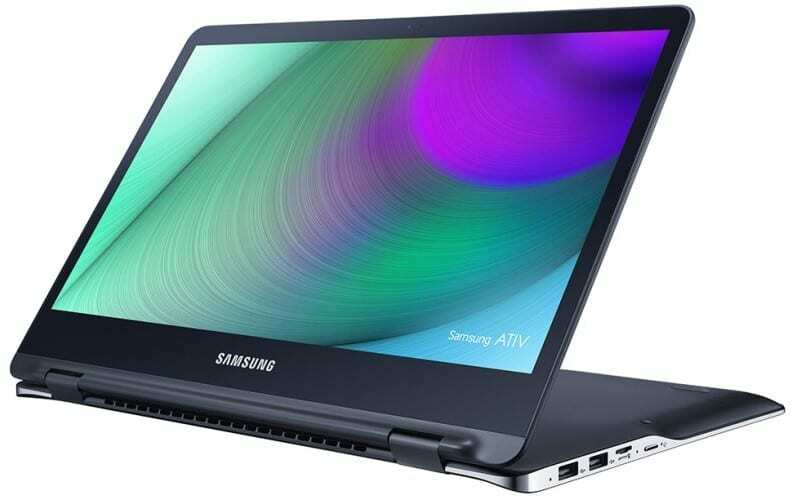 Unveiled alongside Ativ Book 9 Pro, the eye-catching Samsung Ativ Book 9 Spin is the first convertible laptop to come from the stable of its Korean maker and looks like one capable of roughing it out with rivals such as the Lenovo Yoga 3 Pro and HP Spectre x360. The hybrid displays an elegant, slim and light design and is configured for superb performance with latest Intel Skylake processor and ample RAM. Samsung Ativ Book 9 Spin flaunts a premium, chic look with a body made of aluminium. It is remarkably thin at only about 15mm – that is thinner than the insanely-thin MacBook Air. And at a weight of only 1.3 kg, it is also lighter than the Apple ultrabook. The laptop features a rotatable hinge that allows you flip the screen around full 360 degrees to use as a tablet. Samsung Ativ Book 9 Spin sports a 13.3-inch with a Quad HD+ resolution of 3200 x 1800 pixels for awesome clarity. The 2-in-1 ultrabook has an outdoor mode which enhances the screen brightness to as high as 700 nits for comfortable use when outdoors. Decked out with the latest Intel Core i7-6500U processor, Samsung Ativ Book 9 Spin is engineered for robust performance and remarkable multitasking. The Skylake processor, which runs at a speed of 2.5 GHz, gets dependable support from RAM of 8GB capacity. The hybrid will run on the latest Windows 10 operating system, which is designed for great user experience when used on machines such as this. The new Continuum feature in the OS makes transition from laptop to tablet seamless. Zippy solid-state drive with a capacity of 256 GB is supplied for storage on Samsung Ativ Book 9 Spin for faster boot time and app loading. Samsung promises that the battery which accompanies the convertible will be able to last 7.3 hours on a charge – this will be impressive when you consider the high screen resolution. It features USB 3.0, USB Type-C and full-size HDMI ports amongst its connectivity options. Samsung Ativ Book 9 Spin Convertible is not yet available in Nigeria. Samsung Ativ Book 9 Spin price in Nigeria is expected to start at around N280,000, depending on your location and the configuration of the laptop.